Mountain Pine Beetle: What does the recent outbreak tell us about evolving forest threats? Forest Conditions: Fire suppression efforts in BC prior to the start of the epidemic resulted in a high density of mature pine in the interior of the Province. MPB preferred tree species are ponderosa, lodgepole, western white and limber pines. Prior to the implementation of fire suppression efforts, 157,000 cords of mature pine were estimated in this region. As a result of fire suppression efforts the volume of pine skyrocketed to approximately 526,000 cords prior to 2000.1 The high density of mature pine provided an ideal environment for the massive MPB outbreak to begin. Climate Change: Climate change is a major factor in the geographic range and severity of the outbreak (Figure 1). Winter weather in BC has historically included periods that were consistently cold enough to limit MBP activity. Due to a combination of warming climate and regional weather patterns BC has been without a killing frost since 1996.1 A week or more of temperatures at or below -31 F are required to kill overwintering MBP. The work of Logan and Powell provides guidance for evaluating the likelihood of climate-enabled range expansion of pests similar to the MPB. They differentiate between pests in which diapause (a period of delayed development in response to environmental conditions) inhibits response to warming temperatures and those pests such as MPB that are directly responsive to warming temperatures. They theorize that pests not inhibited by diapause will be more adaptable to a warming climate. Southern pine beetle is similar to MPB in this respect and in fact the range of the southern pine beetle is moving north as climate warms. Given the complexities of forest/pest interactions it will be necessary to take a multipronged approach to identifying and responding to changing threats. Modeling such as that carried out by Logan and Powell can provide valuable insight on possible range expansion. Once climate-related pest thresholds are identified, enhanced monitoring can be deployed to provide early warning and maximize management response time. Organizing and delivering information on evolving climate-related threats by geographic region is one of the primary goals of the Climate Smart Land Network. 2. Logan, J. & Powell, J. Ghost Forests, Global Warming, and the Mountain Pine Beetle (Coleoptera: Scolytidae). Am. Entomol. 47, 160–173 (2001). 3. Cullingham, C. I. et al. 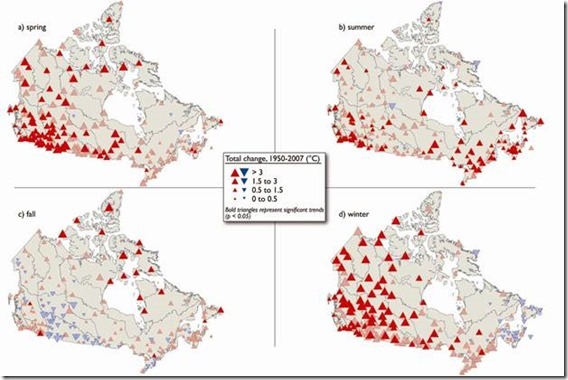 Mountain pine beetle host-range expansion threatens the boreal forest. Mol. Ecol. 20, 2157–2171 (2011). On May 6, 2014, the White House released the third U.S. National Climate Assessment Report. 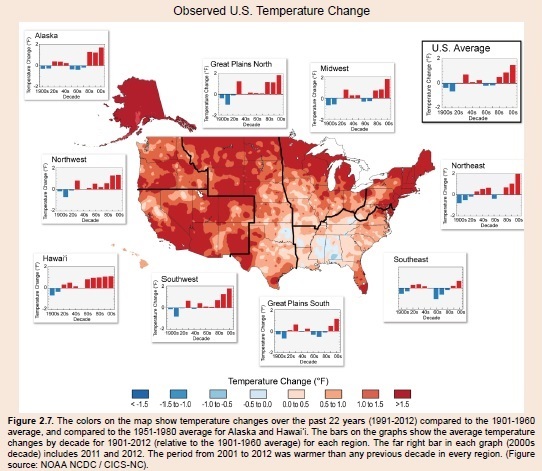 The USNCA is the most authoritative and comprehensive source of scientific information to date about climate-change impacts across all U.S. regions and on major sectors of the economy. The Assessment was produced by the U.S. Global Change Research Program, established in 1989 by Congress to assist the Nation and the world to understand, predict, and respond to human-induced and natural processes of global change. The Third Assessment was authored by a group of over 300 scientists and reviewed by the National Academy of Sciences. Climate Smart Land Network members should be aware of this report. The purpose of this Bulletin is to summarize a few of the essential conclusions for you. You can visit the Global Change Program’s web site for more information. The central message of the report is that human-caused climate change is not a distant future threat. We are seeing the effects today. Compared to the previous Assessment (2009), the 2014 update finds increasing evidence of sector-specific climate impacts on natural resource-based industries such as forestry and agriculture. The length of the frost-free season (and thus the growing season) has been increasing nationally since the 1980s. As a result, forest productivity has increased in those areas that are not moisture limited. 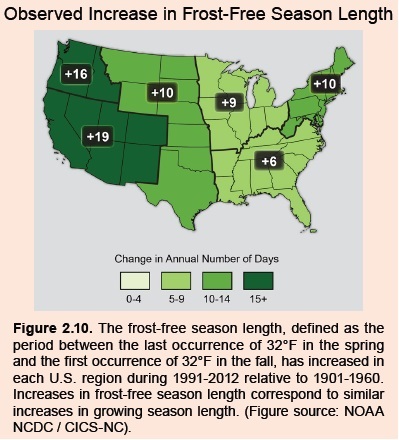 Additional increases of a month or more in the growing season are projected across most of the U.S. as greenhouse gas emission rates continue to rise.¹ Figure 2.10 shows the increase frost-free season length during the period 1991-2012. 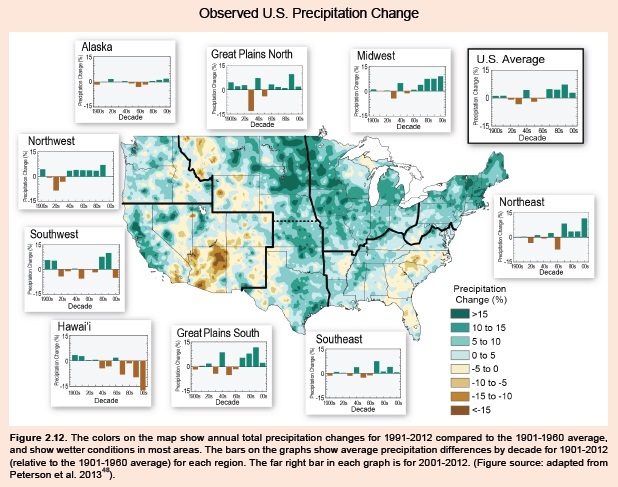 Average U.S. precipitation has increased since 1900, but some areas have had increases greater than the national average, and some areas have had decreases. More winter and spring precipitation are projected for the northern U.S., and less for the Southwest over this century.¹ Figure 2.12 shows change in total annual precipitation for 1991 – 2012 as compared to the 1901 – 1960 average. The regional trends in river flood magnitude (Figure 2.21) mirror the trends in average annual precipitation. 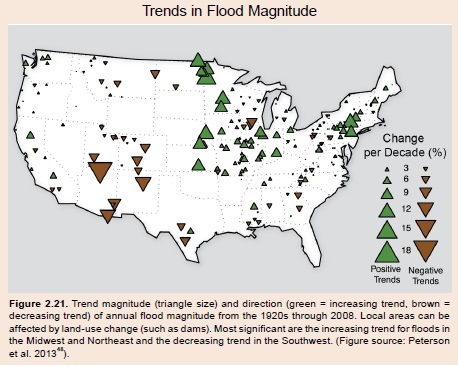 The increase in magnitude of river flooding is smaller than the increase in extreme precipitation due to the fact that the increase in extreme precipitation events have been more concentrated in summer and fall when soil moisture is low and soils can absorb a greater fraction of rainfall.¹ Flash flooding trends in small watersheds with steep slopes that concentrate water flow are more directly linked to regional trends in extreme precipitation. If you are interested in greater detail on seasonal trends in temperature and precipitation than provided in the Assessment, a set of reports developed by the National Oceanic and Atmospheric Administration in support of the 2014 Assessment are linked on the CSLN website: http://climatesmartnetwork.org/resources-regional-trends-and-projections/. These reports are valuable in that they use consistent methods to identify and depict statistically significant trends for all of the regions in the continental U.S., making it easy to compare trends and projections between regions. o Forests in the western U.S. have been severely impacted by a combination of increasing average temperatures and increasing extreme heat that have exacerbated the damage inflicted by naturally occurring drought. The stress placed on western forests by these conditions has coincided with a massive pine beetle epidemic and extensive wild fire resulting in widespread forest mortality. Temperature-related forest stress is projected to worsen in moisture-limited regions as the climate continues to warm. 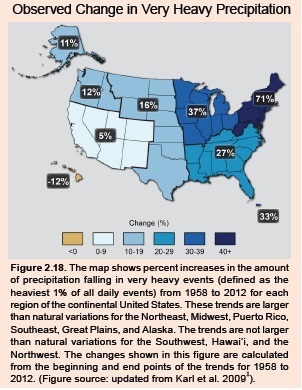 o Projections for forests in regions with increasing annual precipitation such as the Midwest and Northeast are less dire. As temperatures warm and growing seasons lengthen forest productivity in these regions is increasing. However, stressors such as changing pest and disease pressure, and extreme weather events could blunt opportunities for increased forest productivity. o In regions with ample moisture the combination of warming temperatures and elevated CO2 levels has the potential to increase carbon sequestration and storage rates. However, for U.S. forests in aggregate, the combined impacts of climate change, land use change and forest management practices are projected to result in future reductions in forest CO2 uptake. o Bioenergy is identified as a possible funding mechanism for salvage from damaged forest. The recent expansion of natural gas production in the U.S. has blunted the development of the wood bioenergy market, but the European market for wood pellets continues to grow. The Assessment underscores the regional differences in climate change impacts. Appropriate management response will be dependent on the region(s) in which your operations are located. Note that future editions of the CSLN Bulletin will cover the management implications of changing climate in greater detail. Continued warming temperatures will provide a mix of opportunities and increased forest stress. Longer growing season and a CO2-rich atmosphere will provide opportunities for enhanced forest productivity in regions that are not moisture limited. Opportunities to transition to tree species that thrive in a warming climate will increase. Drought is becoming a more potent forest stressor due to increasing evapotranspiration rates and increased incidence of extreme heat. Opportunities to access northern forests on frozen ground will continue to diminish. The range of pests that are limited by cold conditions will continue to expand. Regions with adequate precipitation will have opportunities for increased forest productivity. Stream crossings and culverts may need to be upgraded to accommodate increasing heavy precipitation and increased flooding, particularly in those regions that are experiencing the sharpest upward trends. The continued trend towards precipitation coming in heavy downpours will increase forest stress.